I just returned from my visit to 3 of the shows during the Tucson Gem Show. The layout was changed drastically this year and I found it much harder to maneuver the show floor. In addition, the vendors in the main ballroom were different from previous years. Most carried finished jewelry pieces OR pricier gems such as rubies and diamonds. There were vendors that carried what I needed (cabachon gemstones, copper, sterling and tools) but they were difficult to find on the show floor. I think that next year I will try out a different show to replace this one. Since there are over 40 shows running simultaneously, it won’t be hard to find a replacement. The other shows I attended were great! The JOGS show this year was much larger and included some of the vendors that I normally found only at the Holidome previously. It is a great venue with lots of selections… including a whole section with Amber jewelry and components. Red Creek Jasper. (upper right corner) was one of my finds. Even though I purchased some of this gemstone last year I just could not resist purchasing more. Red, brown, caramel, green and burgundy are prevalent in the pieces.. and many appear to have landscape images. So perfect for my type of designing! 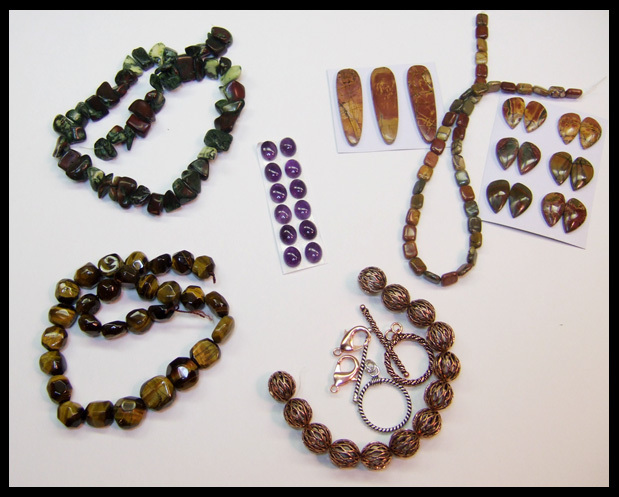 Copper, amethyst and tiger eye are also treasures that I purchased. The most fun and unexpected purchase is shown here. Believe it or not this is coral! The pieces were dyed green and then stabilized to strengthen the coral. I was attracted to the unusual shapes and variation in colors. I have no idea where they will end up in my designs but I had to buy them! That’s what Tucson is all about.. Stocking up, meeting others who share your passion and finding treasures that help me create ‘out of the box’ designs. Join my newsletter for up to date information and specials on my designs. « My First ‘Talk’ about my book. 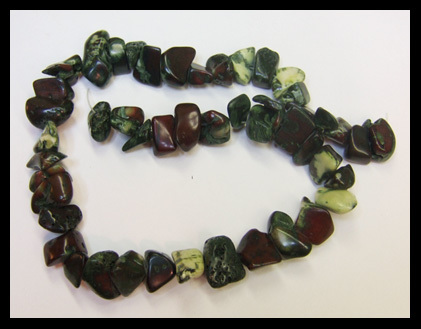 I’ve used that green/red coral before… it’s been called “Watermelon Coral” because of the green and red combination… I love it, and I’ve sold every piece I’ve ever made using it! Enjoy! thanks so much Barbara. So glad to hear it. It sure is beautiful. The green coral is really unusual! It is so beautiful in person! cannot wait to work with it!